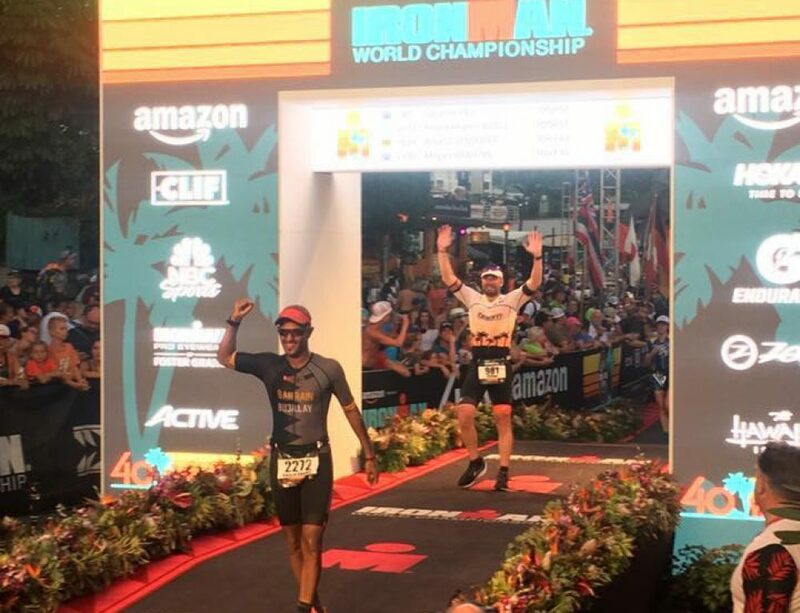 For the first time leading into a race I was filled with nerves because this was my home race and I knew all my friends & family would be watching on course, bust mostly as for the first time I felt I had a legitimate chance at Kona qualification. 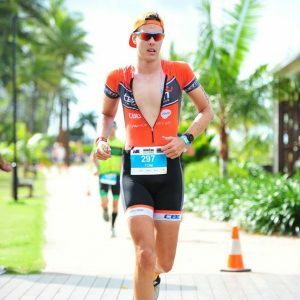 Having just missed a Kona slot by 30 seconds six weeks prior at Ironman Port Macquarie (congratulations fellow 18-24yr old TEAMie Tom Callaghan for getting a slot there) the fire was burning to get the result after a solid 24 week lead up, which included multiple 3:45 am starts! Even though I was at home, I took a few days off work to rest up and get the final quality training sessions in with coach Nathan ‘Sandy’ Sandford. Sandy and I met up on the Wednesday to talk race plans, but this simply turned to “play to your strengths”. Basically, I had to swim hard, ride hard, and do my best to hold off any fast finishing runners. 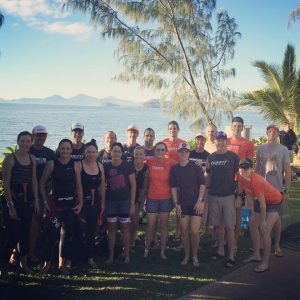 The days passed by, and it was great to meet the TEAM crew from around Austalia as we went for few open water swims on the swim course. On Friday my sister (and number one fan) arrived from Townsville which was good to hang out with her race day eve, and before I knew it, it was race day. Sandy had told me in our pre-race catch up to make sure I started in the top third of the ‘Sub 1hr’ wave, but being a bit behind schedule (after the traditionally long Ironman toilet que, and trying to find some sunscreen) I found myself right at the back of the first wave. Not where I wanted to be. But that was ok, as I got to start with Cairns based TEAM coach Laura Whenmouth, and Cairns TEAMie Alex ‘Superfish’ Hall. We all jumped in the water at a similar time, and were off racing. The wind had pick up a fair bit and quite a swell had developed, but nothing to write home about. This was something we all had to deal with. After about 1500 m I was feeling pretty sluggish, which was disappointing considering the swim had recently become one of my stronger disciplines…Oh well, one of the days. 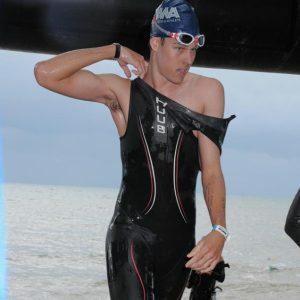 I was working hard to swim at pace when Alex swam up right next to me at the start of the second lap. I thought to myself “Alex is a great swimmer, so just stay with her for the rest of the swim”. I kept her purple swim cap right in-front of me, and we soon reached the beach to finish the swim leg. Thanks Alex! Swim: 1:01 – 14 minutes faster than last year. The bike is my strongest leg, and I was itching to get out there and try to put some time into the rest of the age group. Right as I left T1 I saw my Mum and Sister standing there waiting for me in the drizzling rain. Rain, hail, or shine those two are always at my big races cheering me on. I gave them a wave, and it was time to ride. I quickly took on some nutrition within the first 2 km and began to settle into a rhythm. Nothing special to report in the first few hours, just riding and being consistent. Although, the whole ride it rained on and off, which made for some nervous descending down the Rex Range, but being born and bred in Northern Australia, a little rain is no big deal. The kilometres ticked on, and I was conscious to continually keep eating and drinking. In the process, making my way through all 3200 calories worth of food and drink I brought for the ride, it takes a lot of energy to propel nearly 90 kgs of me down the road! At about 115 km I made the final turn at Port Douglas and it was time for 65 km of block headwind back home to Cairns. Sandy had told me to wait until this point to push through field and stay strong in the wind. I took on some caffeine and tried to mentally prepare for this nearly 2 hours of headwind. Relentless is what the wind was, but again, everyone had to deal with it. By the time I got to Palm Cove, there was hardly anyone one around and I rode the majority of the last 30 km solo. At this point everyone was riding a pretty similar pace, and starting to prep for the run. 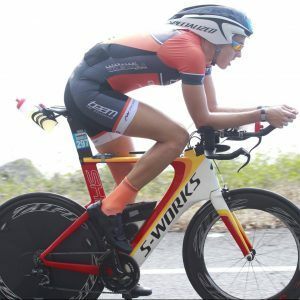 Back into Cairns, and the crowd was already out in force as the 70.3 was finishing up, and right on que my sister was there at the dismount line yelling splits at me. About a 15 minute lead, great news! Bike: 5:08 – 15 minutes faster than last year. Running. I have a love hate relationship with running. When I started triathlon in 2011, I remember ‘running’ 1 km and thinking “this is basically impossible”, but I suppose consistency and persistence can pay off in time. Anyway, I ran out of transition, put on my race belt and got myself sorted. Time to run a marathon. As always in Ironman, the first 5 km always seem ‘easy’ as your legs just want to run faster and faster, so you have to hold yourself back. I ran at about 5:05-5:10 min/km pace for that period. 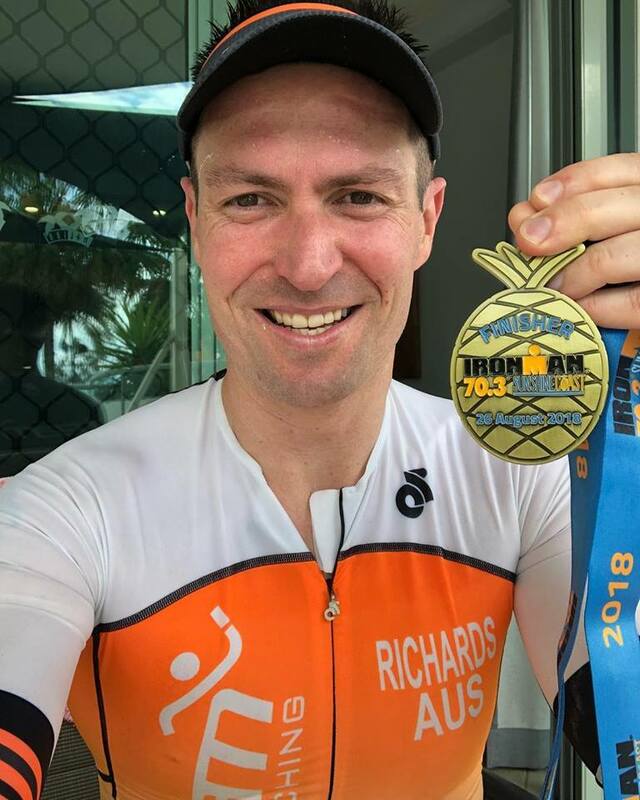 At around 6 km I ran past TEAM Tri big boss Xavier ‘X’ Coppock, who told me in a very firm yet calming voice “You have 15 minutes on them, and the top 5 are all running the same pace. Just relax and find a rhythm”. So I did just that, settled in and went for a Sunday run, with 2000 other people. Then disaster at the 10 km mark. I tripped over my own foot. Bloody Stupid. I was down on all fours, basically crawling, I jumped back up and started to run again. I did a quick review in my head, “Ok you just got back up and ran 10 m, so nothing is broken. You’ll be right, only 32 km to go”. Well, it wasn’t a pleasant 32 km. I could feel a sharp pain shooting through my left foot on every step. 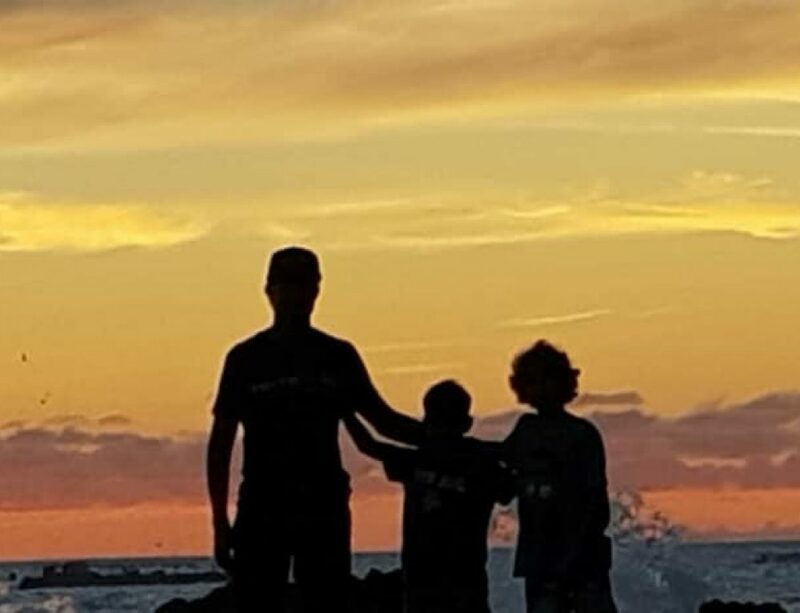 This time, it was something that just I had to put up with. I got back to where X was standing at about 14 km, and he simply said “Mate, your age group are all running the same pace. 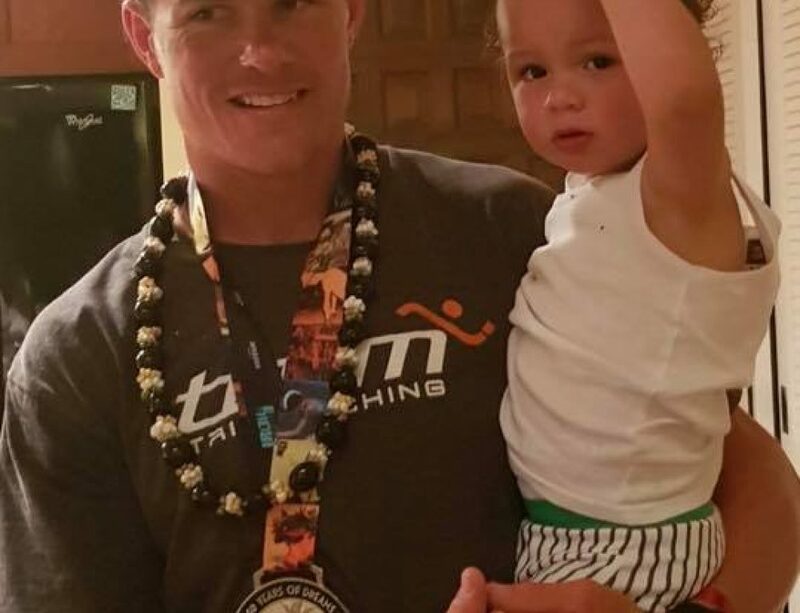 If you stop, you don’t go to Kona.” ….Better not stop then! 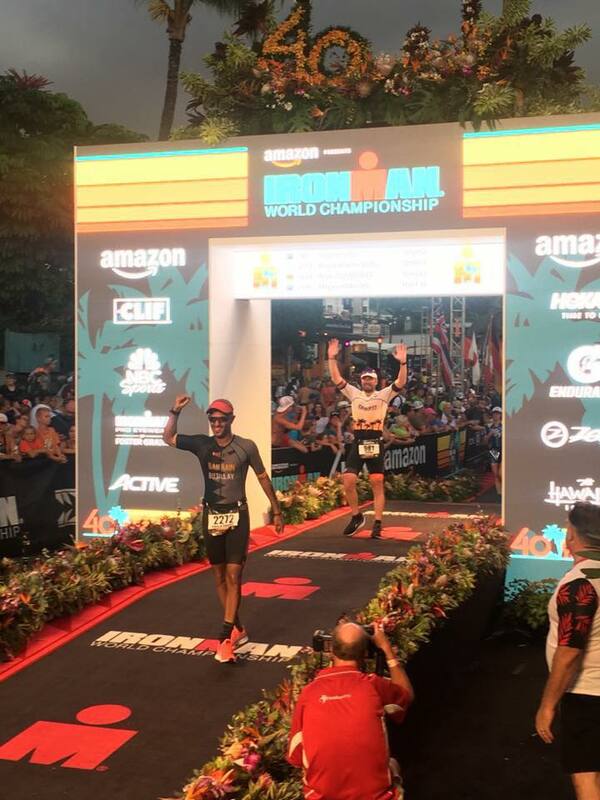 With the support of the home crowd, which seemed like every second person knew me, the finish line got closer and closer. I saw Sandy out on course, who himself was top five in the highly competitive 35-39 age group, and it was motivating to see him doing so well. My sister continued to give me the splits, and second place was starting to slow, and by 36 km I was beginning to get pretty confident I had a Kona slot. Making the turn onto the esplanade for the final time, I could see the TEAM Tri support crew way down the road, and being 6ft 6 in bright orange, they could see me too! X yelled out “You’ve got it mate!” and I got to really celebrate the last 500 m. That is a half kilometre run I will never forget. 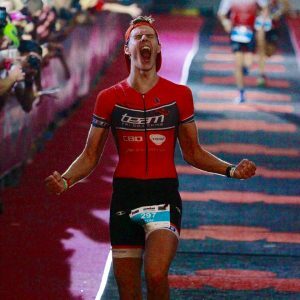 Yelling and screaming (as you should for any ironman) and high fiving my mates as I ran through the ‘beer mile’ for the last time and into the finish chute. I may not have got the run I wanted, but it was enough to get the job done. 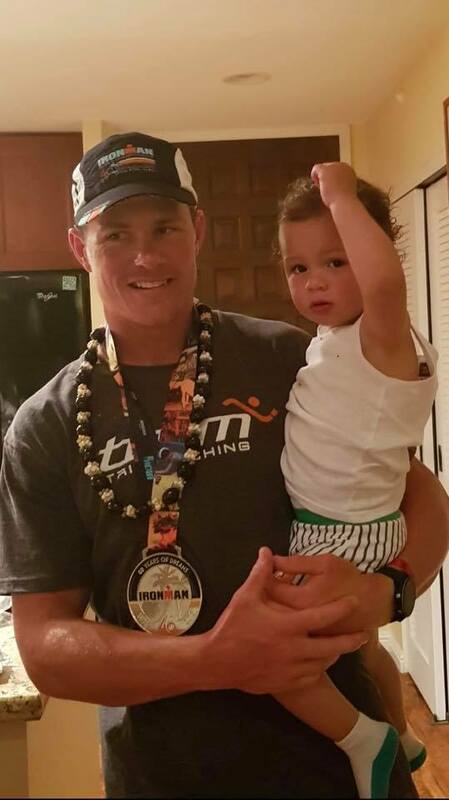 Kona Bound! Run: 3:54 – 66 minutes faster than last year. As soon as I crossed the finish line, the body had simply had enough, and I couldn’t put any load through my foot. But at the time, I didn’t really care. After getting so close in Port Macquarie, and now getting the win in Cairns I was overwhelmed with emotion. Everything worked out perfectly. Sandy found me sitting in recovery destroying a bowl of ice cream, and he had placed high enough to earn an automatic qualifying spot! With Laura already Kona bound and Cairns TEAMie Sue Crowe also qualifying in Cairns, TEAM Tri Cairns will be well represented in Kona. Awesome. 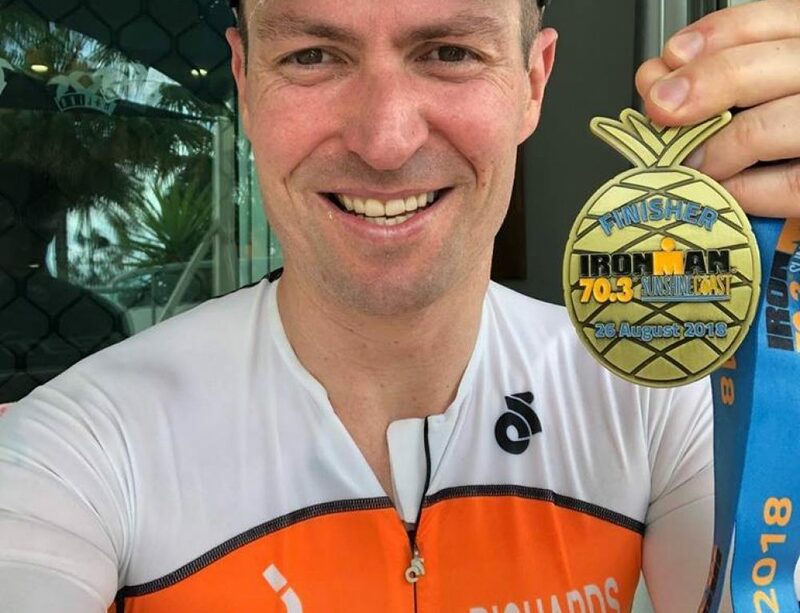 I managed a 95 minute improvement PB, from last year’s Cairns Ironman thanks to the positive atmosphere and hardworking ethic of TEAM Tri coaching. I’m proud of what I achieved, and proud to be part of TEAM Tri. Thankfully, after a few post-race beers and Maccas Cheeky Nuggies, I managed to walk over to the TEAM crew and thank them all for the great support all day. Thank you to mum and my sister for always coming to my races, and to all my family and mates that came down to watch for the day. I may not have said much (or anything) to you during the race but I certainly heard you and all the encouragement really helps! And of course thankyou to the TEAM Tri crew around Australia, particularly Cairns crew and of course Super Coach Nathan Sandford, I would never have even contemplated some of those training sessions without you. Lastly, after 4 weeks in a moonboot, I can walk properly again and have started the build to Kona 16!